I don’t breathe deeply enough. I often race through life, taking shallow breaths. When I am stressed, or in labor, I finally take deep cleansing breaths as I try to cope. Labor with my Sunshine-headed son was intense back-labor from the start. Tears filled my eyes from the steady pain, with no relief in sight. I tried to stay calm but hours and hours without eating and an extremely tense back didn’t lend itself well to this endeavor. Finally the time came to push but the nurse told me I needed to pant instead. What’s that you say? Not push? I’m pretty sure that’s not happening. Often I push my way through life—prematurely trying to make things happen according to what I think is best. His ways are so different and higher than ours. He is the Giver of breath, of life, and He is there when we breathe shallow, hold our breath or feel like we can’t take our next one. I want to breathe deeply and not because I’m trying to cope or labor. I want to let God’s love, creativity and care fill my lungs with grace. I want to exhale praise and gratefulness for all He is and all He does. Let’s reserve our panting and pushing for the delivery room. Let’s thank God for the very breath we have, right now. 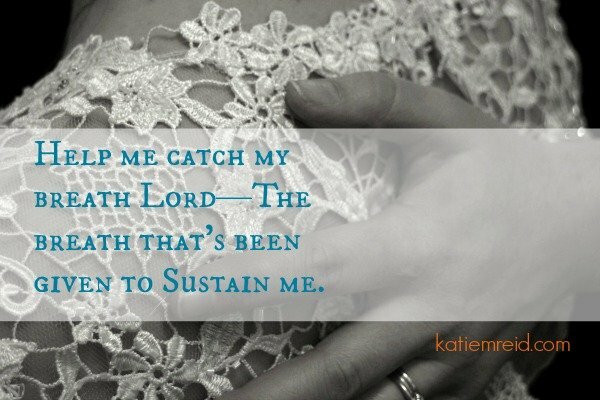 Let’s slow and demonstrate trust as He sustains us. Glad to see your smiling face Lux. Yes, deep breaths—breathe in God’s grace and breathe out His praise.